Gabbro is a dark, coarse-grained, intrusive igneous rock chemically equivalent to basalt because it shares a common origin, magma, with basalt. As magma emerges from the mid-ocean ridges the upper layers harden to form basalt while the lower layers trapped beneath the basalt layer cool into the crystalline mass that is the plutonic rock, gabbro. Vast expanses of the Earth's surface are underlain by gabbro within the oceanic crust. German geologist Christian Leopold von Buch named gabbro after a town in the Italian Tuscany region. This rock often contains valuable amounts of sulfides of various metals, including sulfides of chromium, nickel, cobalt, gold, silver, platinum, and copper. In addition, some varieties of the rock, known as "black granite," are often used as ornamental stones, paving stones, and graveyard headstones. Gabbro is dense, greenish or dark-colored and contains varied proportions of different minerals, such as pyroxene, plagioclase, amphibole, and olivine. Gabbros contain minor amounts (typically a few percent) of iron-titanium oxides such as magnetite, ilmenite, and ulvospinel. Gabbro is generally coarse grained, with crystals in the size range of one millimeter or greater. Finer grained equivalents of gabbro are called diabase, although the vernacular term microgabbro is often used when extra descriptiveness is desired. Gabbro may be extremely coarse grained to pegmatitic, and some pyroxene-plagioclase cumulates are essentially coarse grained gabbro, although these may exhibit acicular crystal habits. 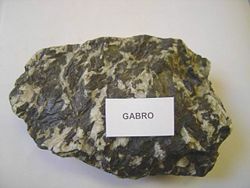 Gabbro can be formed as a massive uniform intrusion or as part of a layered ultramafic intrusions as a cumulate rock formed by settling of pyroxene and plagioclase. Cumulate gabbros are more properly termed pyroxene-plagioclase cumulate. Gabbro is an essential part of the oceanic crust, and can be found in many ophiolite complexes as parts of zones III and IV (sheeted dyke zone to massive gabbro zone). Long belts of gabbroic intrusions are typically formed at proto-rift zones and around ancient rift zone margins, intruding into the rift flanks. Mantle plume hypotheses may rely on identifying similar massive gabbro intrusions and coeval basalt volcanism. Gabbro often contains valuable quantities of chromium, nickel, cobalt, gold, silver, platinum, and copper sulfides. Ocellar (spotted) varieties of gabbro are often used as ornamental facing stones and paving stones. It is also known by the trade name of "black granite," which is a popular type of graveyard headstone. Farndon, John. 2006. The Practical Encyclopedia of Rocks & Minerals: How to Find, Identify, Collect and Maintain the World's best Specimens, with over 1000 Photographs and Artworks. London: Lorenz Books. ISBN 978-0754815419. Pellant, Chris. 2002. Rocks and Minerals. Smithsonian Handbooks. New York: Dorling Kindersley. ISBN 978-0789491060. Shaffer, Paul R., Herbert S. Zim and Raymond Perlman. 2001. Rocks, Gems and Minerals. New York: St. Martin's Press. ISBN 978-1582381329. ODP/TAMU Science Operator. 2006. Igneous Petrology. Integrated Ocean Drilling Program, Texas A&M University. Carey, Bjorn. 2006. Scientists Find the Elusive Gabbro. LiveScience.com, Forces of Nature. This page was last modified on 16 May 2017, at 19:24.